Savills Singapore announced on July 2nd of the launch for sale by tender of a mixed-use development. The launch of the collective sale of the mixed-use development, Sixth Avenue Centre, was posted a just a few days before the Government announced the new property cooling measures. The tender for Sixth Avenue Centre will close at 3pm on 25 July 2018. Completed in the mid 1980s, the freehold mixed-use development which consists of 7 shops and 18 apartments, occupies a prominent corner plot of 1,394.4 sq m (or 15,009 sq ft) at the junction of the main Bukit Timah Road and Sixth Avenue and approximately 150 metres from the Sixth Avenue MRT station. The site is zoned for commercial & residential use with a gross plot ratio of 3 under the 2014 Master Plan. It may be developed up to 5-storeys with an allowable gross floor area of 4,183.2 sq m (or 45,028 sq ft). Subject to approvals by the relevant authorities, the site can potentially accommodate a development with shops and 35 apartments averaging 753 sq ft each with a total gross floor area of 18,011 sq ft and 27,017 sq ft respectively. In principle approval from the relevant authorities has also been obtained for a serviced apartment and commercial development. The mixed-use development, Sixth Avenue Centre, is located within an established residential neighbourhood surrounded by popular condominiums such as Royalville, Fifth Avenue Condominium, Sixth Avenue Ville and Villa Azura as well as prestigious mixed landed homes and Good Class Bungalows. Guthrie House, a commercial building, is situated opposite. It is a short drive to trendy eateries and shopping amenities at The Grandstand, in the Dempsey Hill and Holland Village enclave and the green lungs around Botanic Gardens. Reputable schools located in close proximity include Nanyang Primary School, Raffles Girls’ Primary School and Henry Park Primary School. 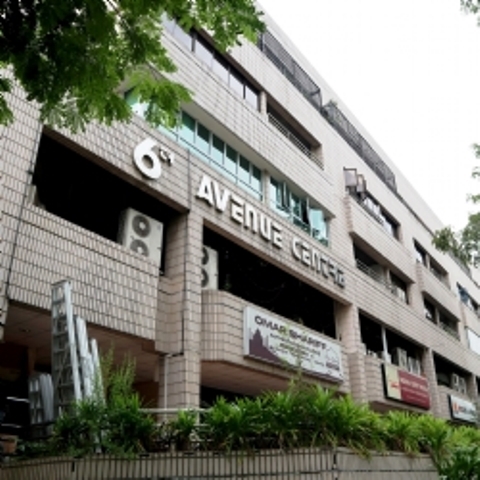 Based on the allowable Gross Floor Area of 4,183.2 sq m, the reserve price for the Collective Sale of Sixth Avenue Centre is S$86 million which translates to a land rate of S$1,922 psf ppr including a small development charge of approximately S$557,000. An application has been made to SLA for amalgamation of an adjoining state land parcel. If approval is granted, the subject site will be enlarged with a reduction in the effective land rate. On 6 July, the Government acted to cool the residential property market. Additional Buyer’s Stamp Duty (ABSD) rates were raised for some categories of residential property purchases, and the Loan-to-Value (LTV) limits on residential property purchases were lowered. Property market stakeholders have suggested thatthe new measures are expected to subdue sales volume although home prices could still inch towards 10 per cent for full-year 2018. Analysts have suggested that investors interest in mixed-use development and commercial/industrial properties would not wane as a result of the new property curbs. Cushman & Wakefield agreed with JLL’s assessment and said that interest in commercial and industrial properties could spike as investors look for alternative opportunities. A mixed-use development is especially are especially attractive to investors as they are viewed as a rational answer to higher-density living in metropolitan cities. As such, mixed developments, which encompass both commercial and residential units in a single complex, have become increasingly popular here in recent years. This is really no surprise, as the fast growing population in land-scarce Singapore has resulted in a surge in demand for homes and amenities alike. To address the concerns over land scarcity and urban liveability, more developers are starting to roll out mixed developments across the island.